Sometimes I think that if “The Annual Most Boring Family Award” was a thing, my family of 5 would win it every year. We do really enjoy each other’s company...it’s just not in a splashy or exciting way. All of us (with the exception of our adventurous 5 year old, poor guy) are homebodies of varying degrees. My husband and I are content at home, and increasingly so the older we get. Every time I go out, there’s a part of me that wishes I could just stay in. My oldest is the most extreme. He utterly hates leaving the house for almost every reason, and must be coaxed to even go for a bike ride. My middle child is happy to go out but just as happy to stay in. The youngest is just biding his time until he can escape the hostage situation. I was convicted to make a list of the ways we do have fun (do we??) and then to think of some more things that we can do to spend intentional time, and create happy memories, together…even if we don’t leave the house. And yes, I am resolving to start doing a better job of getting that little guy to the playground and the laser tag zone (ugh) more often. Promise! This is surprisingly fun. Raid your closet and old Halloween costumes, break out the face paint and the make-up, and play dress up. Take some selfies (essential!) and do it again. You’ll feel like you’re a 9-year-old, and it’s wonderful. There are a handful of great books that every family should read together. The Lion, The Witch, and the Wardrobe was the start of it for us. Snuggles and coziness and Mom reading...it’s like going back in time, and it’s just the sweetest. I’m not really a fan of board games, but we’ve really gotten into charades recently. We’ve never laughed so much! We also like cards. With my 5-year old, we make an entire game out of seeing who draws the highest card, over and over again, until the deck is gone. Whoever has the most cards in their pile at the end wins. He’s obsessed. You can do this with any assemble-your-own food, like pizza or tacos, as well. But since we’re partial to ice cream, we like to break out the sundae bar from time to time. Sprinkles and toppings have a long shelf-life, so they can stand at the ready in the pantry for spur-of-the-moment treats. Or you can really do this up, with crumbled brownies, syrups, whipped cream, chopped nuts, fruit topping...the sky's the limit. Just make sure the kids help you clean up before they run away to jump on the furniture and scream like banshees on a sugar high. Easiest camping ever, and you can cook in your own stove. Set up a tent in the family room, pull out every blanket and pillow you own, and have a sleepover complete with flashlights. We dance. Alot. We have a bluetooth speaker in the kitchen and almost inevitably dinner clean-up becomes a dance party every night. Even the dog has been trained to do some moves when he sees us start up. I think this is a great thing for families. Who else can you bust a move in front of without worrying about looking like a goof? My oldest is 11, and the days are coming soon when he’ll be too old for games like this. I need to capitalize on his youth while I still can and break out the old-fashioned fun a few more times. Plus, how fun is it to jump out from behind a shower curtain at someone? Hilarious every time. A friend of mine texted me this week that her daughter (now 8, and apparently freakishly strong) had somehow just beat her at arm wrestling. Baffled, I immediately challenged all of my children. I’m thankful to report that none of them could beat me, but they all had a blast trying. It’s now their goal in life to take down their parents in this sport, and my dedication to lifting weights has been renewed! Double win. Posted on March 7, 2018 by Laura Irion and filed under Building Your Family and tagged family fun. Looking back at my childhood, some of my fondest memories of Christmas were the traditions we had as a family every year. Now that we have our own family and our girls are getting older, Mark and I have come to realize that the traditions we have started to set in place are an important value for us. Already, some of their favorite Christmas memories are the traditions we have, not the presents they receive. Presents can break and lay forgotten, but the traditions and memories that are made, are built for a lifetime. Children love routine. Even when it comes to Christmas, they like routine. Whether you open presents Christmas Eve or Christmas Day; or you have to eat breakfast before you open presents, make sure you try and do it the same way every year. What you do every year makes a fun memory for your child. They look forward to it and often times will talk non-stop about it☺… thus, creating your traditions. There are so many different traditions you can have for your family, whether you take some from your childhood, create your own or adopt some traditions from another family. Anyway you go about it, just make them your own. I’m going to share four Christmas traditions we have, one is from my childhood, one is from Mark’s childhood and the other two are ones we adopted and created for our girls. My favorite tradition we had growing up was on Christmas Eve. Every year we gathered around the Christmas tree and lit candles around the living room and turned off all the lights. My dad would read the Christmas story from the Bible and then we would sing all the Christmas carols we could remember…I remember my dear Nana Pat would harmonize in her sweet alto voice every year. After we sang, my mom would place the different kinds of Christmas cookies we made out on the table. We would enjoy some Wassail that had been brewing on the stove with the aroma wafting through the house while we sang. (Wassail is a warm apple cider drink with fresh oranges, cloves and many other spices). This is a tradition we have carried on with our children and they look forward to it every year! They even were able to hear Nana Pat sing for several years before she passed away.The second tradition we have is from Mark’s childhood. His sweet grandma made homemade donuts every year called Cruellers. Mark grew up making them with his family and a couple years ago we decided that it would be a super fun tradition to carry on every Christmas Eve morning with our family. We make the dough from scratch and we have a donut cutter that even cuts out the donut holes! The girls help cut out the donuts and Mark is the official fryer. Yes, that’s correct, they are fried…and so worth every calorie! Then once they cool for a minute we fill one big ziploc bag with cinnamon and sugar and another with powdered sugar and the girls take turns shaking the donuts in the bags. They love this! The third tradition we have is picking out Christmas ornaments. I’m not sure what year we started this, but it has been several now. We take them to a store and they each get to choose their own ornament for the year. When we get home we write their initials and the year they bought it on the ornament and then hang it on our tree. The idea behind this tradition is that they will be able to take all of their ornaments they picked out over the years and add them to their own tree when they move out. More memories from their childhood! We also choose a special family ornament every year and date it as well. We usually try to pick one out that represents some significant event or time from our year as a family. The fourth tradition we have is our hot cocoa pajama run. After the girls are snug in their beds, we run down the hall yelling “pajama run, pajama run!” They scramble out in their pajamas and we all pile into the car! We go to a local coffee shop for some hot cocoa and then drive around and look at Christmas lights while sipping our hot chocolate. Traditions are a wonderful way to create sweet memories that will last a lifetime for your children. Have fun creating and making your own or adding to the traditions you already have! Merry Christmas and may your season be full of making memories and family and the most important gift of all, Jesus. Posted on December 21, 2017 by Amy Zurowski and filed under Building Your Family and tagged holidays family fun. Ever since before we had kids, my husband and I held the belief that families benefit when they have dinner together. We hoped to make it a priority and, as much as humanly possible, protect family dinner time. It’s something he grew up with every night of his entire childhood. I, on the other hand, only saw my family in passing as I ran from school to work and hit the McDonald’s drive-thru in between.Now that we actually have a family, I see clearly how in theory family dinners are wonderful, and how, in practice...well, they make you want to run for McDonald’s. The oldest launches into a diatribe about the last video game he played. My husband, who is acutely aware of his body’s impending starvation melt down, can’t. even. carry on this conversation, because, please can we pray so I can eat before we talk? The little one insists on praying. But he also insists on finishing his milk and lining up his silverware before he begins said prayer. Finally we get to the Amen and by then tensions are high. My oldest decides to bite the bullet and shove ALL the porkchop in his mouth at once. The middle one decides to get up to find some ranch dressing or other such camouflage for hers. This makes the little one get out of his seat to show us a dance move. This makes the oldest get up to mimic the dance move (now trying not to choke) and then Dad yells at everyone to get back in their seats. Repeat while counting to infinity. I know people that have given up. They’ll just put the TV on and eat in silence. I’m not going to lie to you, that sounds amazing. Sadly, you can’t see our TV from the table. Others just succumb to the sports schedules. Eat and run, eat in shifts, eat by yourself. That also sounds amazing. Sadly, sports is over for everyone in my family by 5 PM. For better or for worse, after 11 years, the family dinner has been established. It’s basically scheduled torture. So we’re left finding ways to make it work. There are only two ways I’ve found to make dinner more pleasant. Number one, (and this is no joke fool proof), cook food that they like. After careful observation, I have noted that when we call Pizza Hut, everyone comes running to the table. No one complains. No one gets out of their seat to dance. They just sit there and eat. It’s awesome. Unfortunately, I can’t feed them garbage every night. I feel like it’s kind of my job to feed them meat and vegetables and healthy carbs. Sorry, kids. Your mom is the meanest. So mostly it’s option 2. 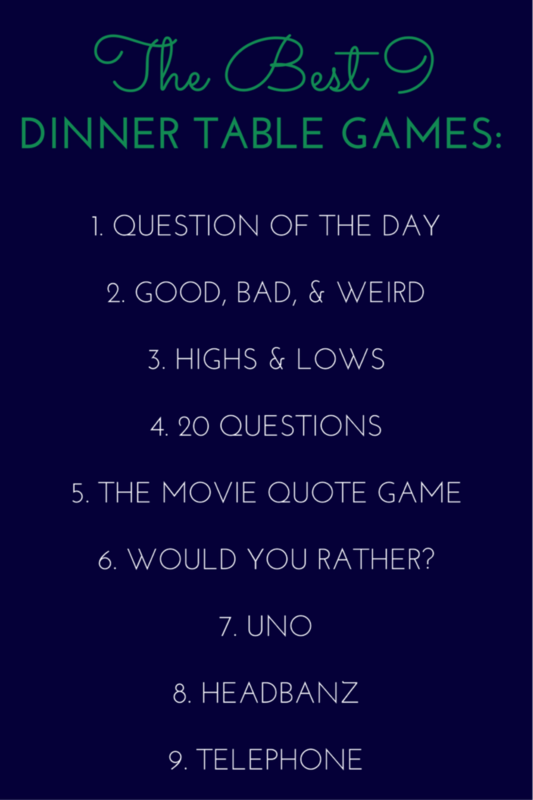 Far less effective, but it can work: Dinner Table Games. This one really works! Each day ask an ice-breaker question (lists abound online) and give everyone a chance to answer. Questions like “How would you spend $1 million?” to “If you could tame and keep any wild animal, which one would you choose?” really get kids’ imaginations going and lead to fun conversation. This is a wonderful way to extract specific details from kids about their days. Everyone has to go around and say something good, something bad, and something weird that happened to them that day. This is another one designed to help kids remember and share their days’ experiences. Everyone shares the high point and the low point of their day. A classic game my grandmother used to play with me to help me fall asleep on Christmas Eve. Whoever is “it” thinks of a person, place, or animal and everyone else gets to ask 20 yes or no questions (as a group) to guess what it is. Everyone gets a turn to say a movie quote, while everyone else tries to guess what movie it’s from. If your family is musical, this can work with song lyrics or humming tunes as well. You can either pre-print a list from the internet or make these up on the fly. Usually the goal is to present two impossible or horrible scenarios, and see which one your kid thinks is worse. I also like to present two choices that are both supremely desirable and see which one they think is better. This might not be the best at the dinner table since you actually have to pull out cards (and it doesn’t exactly facilitate conversation…) but sometimes you’re desperate! My kids LOVE Uno and rarely pass up a chance to play. It brings a certain amount of chaos when you start using props at the table, but once in awhile you just have to mix it up. This is a board game, so, like Uno it could introduce some chaos to your table. Each person puts on a headband and gets a game card that they put into the headband. They don’t know what’s on the card and everyone else has to give them clues as to what they are. Come to think of it, I think there are some phone apps that have similar games. This game will produce hilarity, but it ranks poorly in effectiveness at getting kids to stay in their seats. In fact it will pretty much guarantee they’ll get up so they can whisper in each other’s ears while smearing jelly on each other. Still, playing this with kids is beyond funny. So, a good one to keep in your back pocket...maybe for when Dad is out of town and a little more monkey business than usual will fly. Posted on September 6, 2017 by Laura Irion and filed under Building Your Family and tagged kids' crafts family fun. Naturally, that leads to all kinds of mom-guilt when I let it. Childhood is flying by, and I want so much for them to look back and remember it fondly. 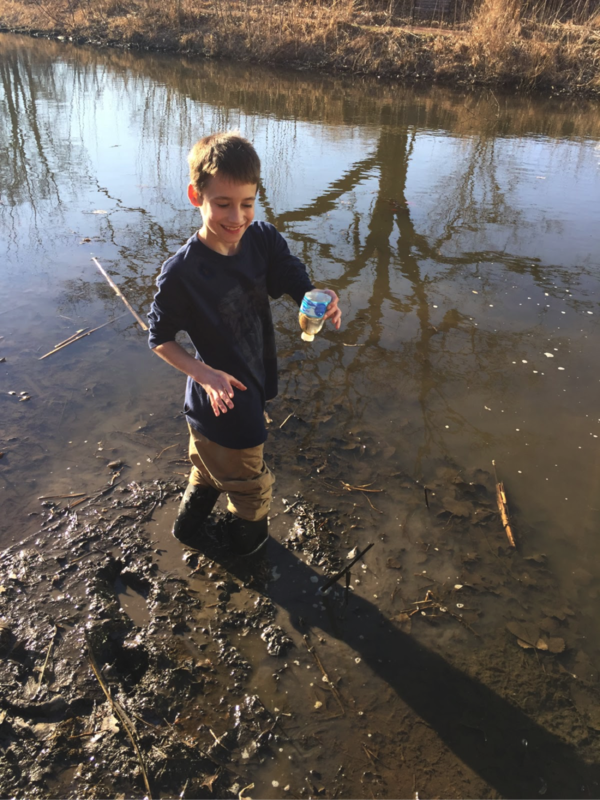 As warmer weather approaches, I am starting to crave an unplugged childhood for my kids. I know they don’t need elaborate vacations, or expensive stuff, or a schedule jam-packed with activities to make happy memories. But maybe they do need an outrageous dose of crazy with Mom & Dad once in awhile—something that will stand out when they think back on growing up. 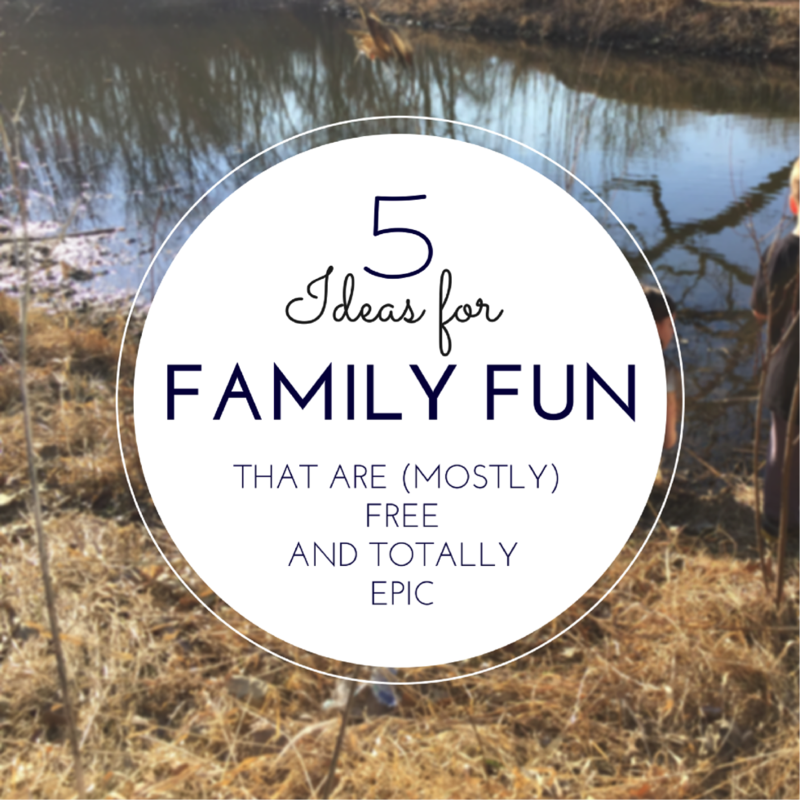 Here are five ideas we’ve done, and will do again, that are epic fun for kids. Yes, some of these are wildly over-the-top ideas that may very well break your sanity. Others are simple to do, but will put a huge smile on your kids’ faces. All of them are about saying “who cares?” and getting messy while your kids are still young enough to want to. This is a regular go-to activity from my friend Holly. Take two sofas and put them together, facing each other, to create one giant bed couch. Then take every pillow and blanket from around the house that you can gather and turn it into a massive nest. Hop into pajamas, fill up the popcorn and pile the family into the nest for a movie night. Then leave it that way for a day or two. It will be so fun to watch your kids turn it into a habitat for play, fort-building and pretending they are birds learning to fly. Yes, your house will feel like a complete wreck, but the fun is worth it. If your kids are anything like mine, they’re obsessed with animals. My 8-year-old daughter wants to be an animal rescuer when she grows up, and we even save the bugs that wander into our house. Though she’d love it, adopting a menagerie of permanent pets is not something I can commit to. Still, I want to indulge her love of God’s creatures and allow our kids the experience of nurturing and loving them sacrificially. 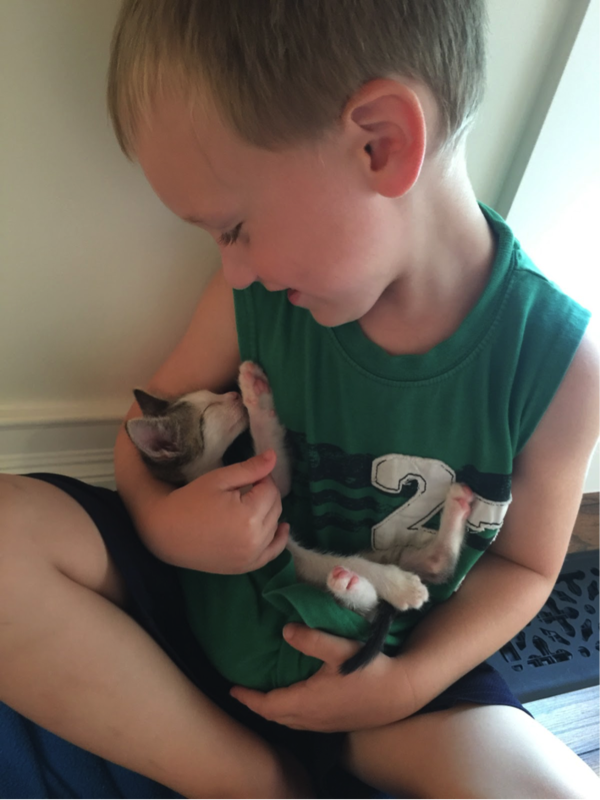 Last fall, we fostered a litter of 5-week old kittens. Yes, it broke our hearts to give them up for adoption afterward, but the joy in our home was palpable while they were here! And it was worth it knowing that we saved these precious babies from being euthanized, and we gave them love and socialization and the readiness to become lifelong companions. (And ironically, I was the most heartbroken of all at the end of it. The kids were a little sad, but mostly they were just excited for the next batch of kittens to arrive!) Of all my suggestions, this one will probably get the most immediate “no way!” but really, if I can do something like this, then anyone can! Your kids will NEVER forget it. To get started, we just filled out a foster application with a local animal shelter. Call me the meanest mom ever, but last year for Spring Break I ordered 6 cubic yards of mulch, had it dumped in our driveway, and gave my three kids shovels. (Of course I shoveled too.) They LOVED it. It was chilly and rainy and my oldest (a 10-year-old boy) had never been so hardworking or happy. The younger ones played in the pile and dug tunnels and helped as well as they could. I put snacks and kleenex on the front porch and locked us all out of the house from 9 AM-1 PM. The job was done in three days, the yard looked amazing, and my kids had never felt such a sense of accomplishment. This was the first time I realized that hard physical work is GOOD for them! So this year for Spring Break we’re tearing down our decrepit old deck. My kids can’t wait. Is there a grown up project you can think of that you can involve your kids in? Their response just might surprise you! If you ask my kids what their all-time favorite fun thing we’ve done at our house is, they might answer “rice in the bathtub.” We’ve done it a few times. I have a large soaking tub in my bathroom, and we will get huge bags of rice from a wholesale store and fill the tub with it. (Word to the wise, close the drain first). We then let the kids hop in with their toys, and play to their hearts’ content. We leave it up for several days. The clean up is horrible! But again, it’s great fun so it’s worth it. If you can’t give up your bathtub, we have also done rice in a giant plastic bin or a kiddy pool. You can use beans too. It’s like a preschool sensory bin but fully immersive. Because, what preschooler doesn’t want to just climb into that table anyway? This is another one from my friend Holly. I *strongly dislike* mud, nature, swamps, and all manner of related earthy things that teem with smells and bugs. For her, it is her happy place. Over the years of her dragging our kids (and me) down to one pond after another, I have learned how good these places are for kids, and for the soul. You have to just turn off the disgusted part of your brain, go in knowing you’re going to get dirty, and embrace it. And once you’re knee deep in the pond, covered in slime and past the point of no return, you will love it. And you’ll know your kids are making memories they’ll never forget. Bring some jars with holes in the lids and long fishing nets, and see what you can find! Early March is great because, even though it’s still cold in most places, the pond Holly drug me to last week was filled with huge tadpoles already. Go online to find a nature preserve close to you and head out. Bonus for my fellow non-outdoor-girls, this time of year the bugs are still sleeping! Posted on March 8, 2017 by Laura Irion and filed under Building Your Family and tagged family fun fun with kids. Looking for a fun, yet meaningful Christmas activity to do when the entire family gathers this Christmas? So was I, until I called my creative friend, Brenda to pick her brain. She had just planned the activities for the staff Christmas party at their church and told me of this activity that I plan to do with my family. For their party they separated into teams and drew a different component or person of the Nativity. It made for a great time of creativity and laughter. After they finished, they each added their piece to the Nativity scene upon a cardboard platform. No instructions were given as to scale. I heard from more than one attendee that it was amazing how everyone lingered over the scene. Our thanks to Trisha Martinez who sent us some photos of their personal Nativity and to Diana C. Kim who took the photos. And of course, to Brenda, who is a great resource of ideas to elevate the celebration of Christmas in keeping with its true meaning. May you and your family appreciate the true meaning of Jesus’ birth as you celebrate this special time of year with your loved ones. Matthew 1:23: “Behold, the virgin shall conceive and bear a son, and they shall call his name Immanuel” (which means, God with us). Posted on December 12, 2016 by Betsy Corning and filed under Building Your Family and tagged holidays family fun. When I became a grandparent almost 12 years ago I started daydreaming about the idea of having an annual “grandma camp.” My thought was I’d invite the grandchildren to our home for a few days in the summer and spend time doing crafts, learning together and just having fun. 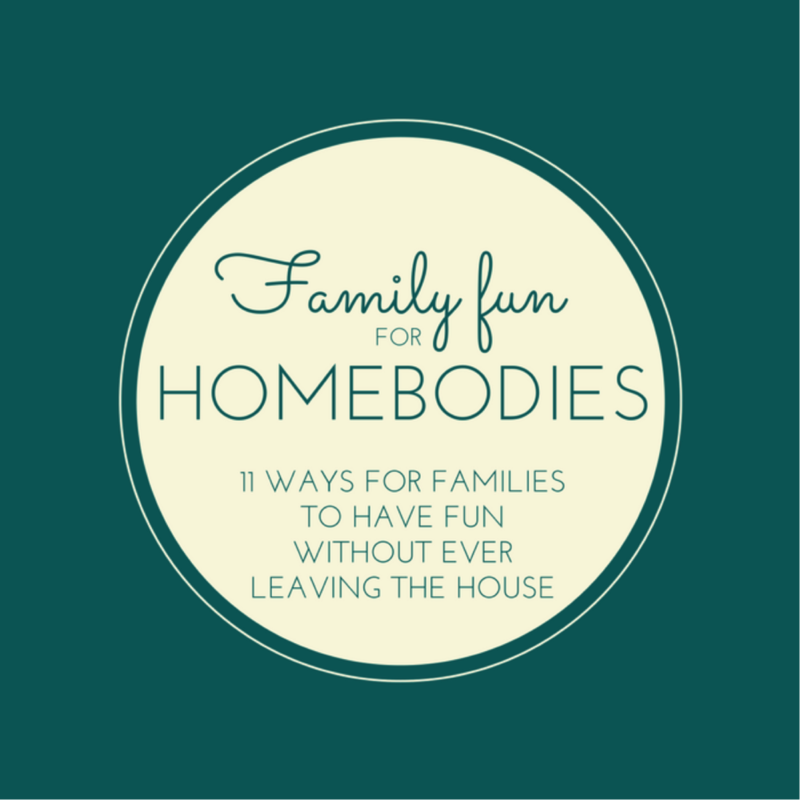 (Think “VBS for cousins” with a few sleepovers thrown in.) Well, when the eldest grandchild, Annabel, turned six in 2011, my dream became a reality. To my surprise—and the kids’ delight—I’ve kept up the tradition and this year I’ll be holding our sixth annual “Camp Noni” (the grandkids call me Noni)! Since our first year, the number of campers has grown from two to six and we already have so many great memories to share! As I was thinking through this tradition, I realized you don’t have to be a grandparent to do something like this. Anybody can have a backyard camp for their own kids (and maybe invite their cousins or good friends). Sending the kids to summer camp is great, but we all know it’s not necessarily realistic for every family. If you’re a really fast planner, you could do it this year (haha), but I’m guessing you’re already in back-to-school mode. Better yet, you might want to spend the next several months coming up with some great ideas! Sometimes just having something to look forward to makes a seemingly endless winter easier to tolerate. 2. Build on the theme as a framework. With the help of the Internet and a little imagination, I have found that there are TOO MANY ideas! b. Search for songs that you can learn or sing together. I have a gifted son-in-law who even wrote a theme song for our camp! He leads us all in a campfire sing-along on the first and/or last nights of camp. This is great fun and the parents and younger siblings also join in for songs and s’mores. In addition to that, I usually find a few songs that go along with the year’s theme and create a playlist we can listen to while we’re doing crafts or riding in the car. c. Try to come up with a Bible story or verse you can focus on throughout your time together. For example, this year I’m using Luke 2:52 as our theme verse: And Jesus grew in wisdom and in stature and in favor with God and man. I’ll also be reading the Parable of the Sower (found in Matthew 13, Mark 4 and Luke 8) which lends itself to a discussion not only about the needs of a plant, but an important spiritual principle for the older kids as well! I even found some great YouTube videos that explain the parable in a way that is simple and engaging even for the younger ones. d. Plan crafts that tie in with your theme that are age appropriate. Again, this was super easy with Pinterest. We’re going to be growing seeds in a baggie and doing some other plant-related crafts this year. I’ve also asked each of the parents to provide several pictures of themselves when they were young. I will also print pictures of each grandchild and let them create their own collage/poster so they can see the resemblance and what their parents looked like when they were young. e. If the kids are old enough, you can plan a field trip or two. This can get pretty expensive and you definitely want to be careful about setting precedence if you plan to make this an annual tradition, so keep it to a minimum. This year, we plan to visit a dairy farm and see some baby animals. We’ll also go to the beach one day and play some miniature golf. It’s a good idea to take along another adult depending on the number of kids. As my group has grown over the years, I’ve had to scale back on the excursions. Flexibility is the key as we adjust to number of campers, ages and budgetary considerations! f. Even food can fit in with the theme if you want! We’ll be enjoying some Flower Pot desserts this year, complete with Oreo “dirt” and gummy worms! 3. Mix in plenty of fun. This is a wonderful time for the cousins to get together, but even if it’s just your own family, be sure to do things you wouldn’t normally do. The memories they are building together will last a lifetime and what is summer about if not being relaxed and doing things you wouldn’t do during the school year? Like sleeping in a tent (even if it’s just set up in the family room because the little ones are either too scared or have to go potty in the middle of the night!) The first year of camp we had a tent in our backyard with great plans for sleeping outside with our six- and four-year-old grands, but in the morning the only people still outside were my husband and 15-year-old son! So be prepared to go with the flow and just enjoy your times together! Posted on July 27, 2016 by Joan Wagner and filed under Building Your Family and tagged family fun.